The success of our Man From U.N.C.L.E. 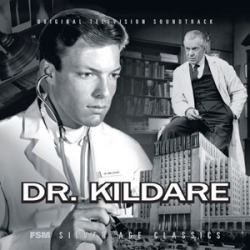 albums led Lukas Kendall to ask me to assemble a 3-disc set of music from Dr. Kildare, the superb 1960s medical series starring Richard Chamberlain. There were five excellent Jerry Goldsmith scores to fill disc 1, and considerable fine material from the likes of Harry Sukman, Morton Stevens, Lalo Schifrin and others to fill discs 2 and 3.